An unusual Sausage King Adventure is shaping up for me for next weekend. 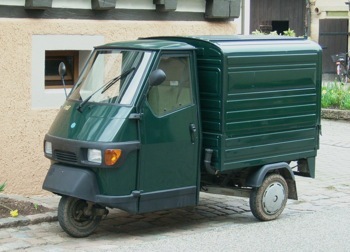 Brays Cottage, our good friends who make the finest pork pies ever are buying a Piaggio Ape van. They need some help getting the van back from Grimsby and that is where I am getting involved! Sausage King to the rescue! The only potential issue to overcome is legroom! At six foot six I just need to know that I am going to be able to fit in the cab to drive it. When it’s all branded up and filled with Brays Cottage pork pies this will be an amazing vehicle and it is nice to be playing a small part in helping a business doing such great things as these guys. Not only is it a fun vehicle it has great ethical credentials. Over 200 miles on one tank of 10 litres of fuel is great going. Plus this means I get to wind myself through the Lincolnshire back-roads as I head back to Norfolk. The hardest decision I have to make is which butcher I should stop and see on the way back. Very tempted to go and see my friends in Woodhall Spa at the most excellent R J Hirst’s. Possibly the best day out ever?